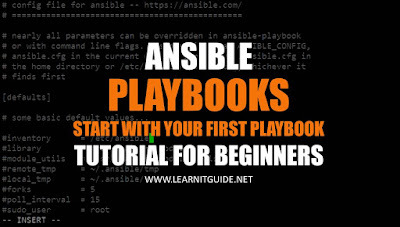 This tutorial explains you about the Ansible Playbook. At the end of this post, you will be able to understand What is Ansible Playbook, how to write a playbook for the automated configurations. In the previous posts, we have explained the below topics. Refer those links to understand this topic from basics. Ansible playbooks are written in the YAML data serialization format. If you don't know what a data serialization format is, think of it as a way to translate a programmatic data structure (lists, arrays, dictionaries, etc) into a format that can be easily stored to disk. The file can then be used to recreate the structure at a later point. JSON is another popular data serialization format, but YAML is much easier to read. Each playbook contains one or more plays, which map hosts to a certain function. Ansible does this through something called tasks, which are basically module calls. 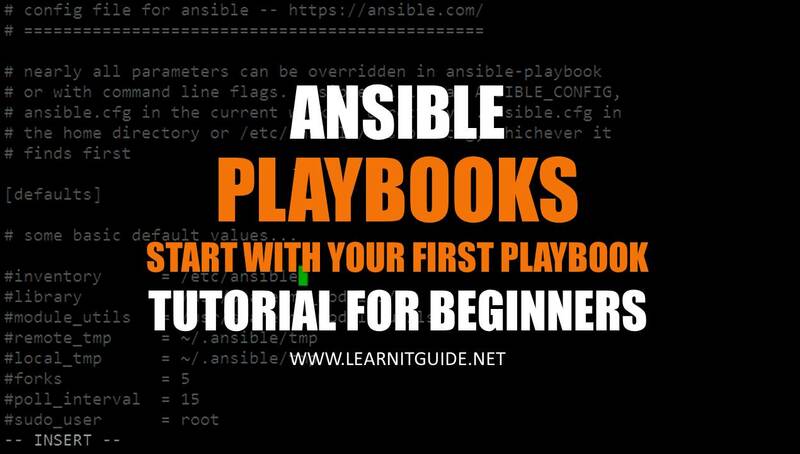 Also Watch this "Ansible Playbook" Tutorial video on our YouTube Channel. How to create a Ansible Playbooks? Create a playbook with a file name, not necessary to have the filename with any extension. but create with extension with ".yml" else you wont find the difference of normal text file and a playbook. This is a requirement for YAML to interpret the file as a proper document. YAML allows multiple "documents" to exist in one file, each separated by "---", but Ansible only wants one per file, so this should only be present at the top of the file. We should be more cautious with the spaces while writing a ansible playbook. Tabs are not allowed here. Character should start exactly or after the previous parameter starts and it should looks like a statement as shown in the above examples. Hosts declaration (- hosts: all) - It defines that on which server groups playbook should run based on the ansible inventory file. Variable declaration (vars) is optional, we see some examples how to declare a variable below. You can also use other parameters like, name, actions, notify, remote users depend on the requirement. As shown in the above example, we should define the tasks to be performed. Under the tasks (tasks:) - You specify the list of tasks to be carried out. Every task should have a name, which will show you in the output while running the playbook and also its easy for us to identify it. For example. Lets say configuring a basic Apache Webserver. Following tasks are needed. 3. Starting and Enabling httpd service. So lets create the task. We can create a multiple task for each actions as shown in the above example. Name : describe the task what it is actually going to perform. Then action what are you going to do. Each task is to execute a module, with very specific arguments. here we have used different modules. yum used to install the package, copy used to transfer the file from source to target server and service used to start and enable the httpd service. Lets do syntax check to ensure there is no syntax error using below command. Above output shows that only host "server1" will be affected with this playbook. Run a playbook and configure the httpd service. Above output shows the summary of the playbooks. Play - Display that this playbook runs on all hosts as per the hosts declaration. Task - Ansible gathering facts(catalog) from all servers to run the actions. Under the task - Changes of the state. Finally, you got the status of the complete playbook as, 4 tasks are OK without any errors and 2 changes are done which are installing httpd package and starting / enabling httpd service. Unreachable and failed are zero. Above example use a variable definition (vars:) to install a multiple packages vim and yum-utils. Similarly, you can modify only the package names. Loops are typically used to repeat a task using different input values as we have used variable declaration. The "notify" item contains a list with one item, which is called "restart apache". This is not an internal Ansible command, it is a reference to a handler, which can perform certain functions when it is called from within a task. We will define the "restart apache" handler below the palybook. The "handlers" section exists at the same level as the "hosts" and "tasks". Handlers are just like tasks, but they only run when they have been told by a task that changes have occurred on the client system. For instance, we have a handler here that restarts the apache service after the package is installed. The handler is not called unless the "copy httpd configuration file" task results in changes to the system, meaning that httpd file from source should be copied to the target server and wasn't already there. There is no use of restarting the service when there is no changes in configuration file. Once copied the new configuration file, service should be restarted. If you find any options started with "=" its a mandatory and should be included in the actions. [root@server1 ~]# ansible-doc yum | grep -i "="